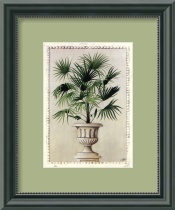 The colors and soft breezes of the tropics are immortalized in beautiful paintings of palm trees. You can create the serenity of a vacation year-round in your home with tropical-style decorating. The soft colors of the tropics found in palm tree art can easily be integrated into your own personal paradise. You can personalize your palm tree art choices with bamboo frames, white-washed wood, or enjoy the rich colors of tropical mahogany stained wood frames. Art is an essential part of any tropical decorating theme. 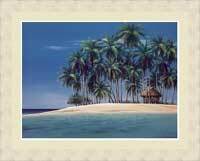 Choose pictures of tropical beaches and continue the tropical decorating theme with printed fabrics and pillows. Tropical fruits can add a stylish accent. Look for bananas, pineapples and coconuts to add a playful touch. Paintings of palm trees, beaches and tropical scenes transform your home into a peaceful sanctuary. You can even use the tropical decorating theme as an accent, choosing the bright, saturated colors of red and aqua and green with brilliant fish paintings. 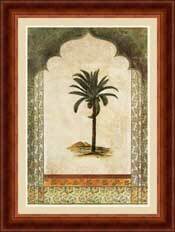 However you use your paintings of palm trees, you will be glad to know that all our art is 100% guaranteed. Shipping is free and our customer service is friendly.